This 2-step process involves a lot of steps that most people would consider unnecessary. 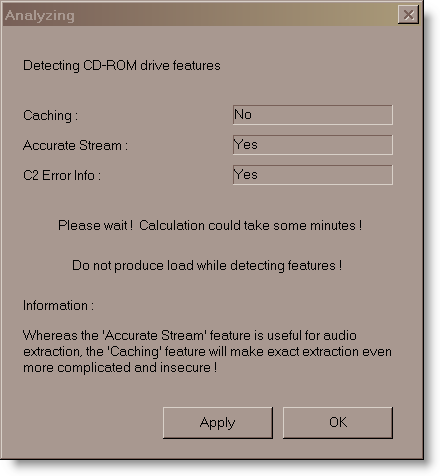 However, if you want to preserve and archive CDs by the most accurate means possible, this may be the page for you. Yahoo! 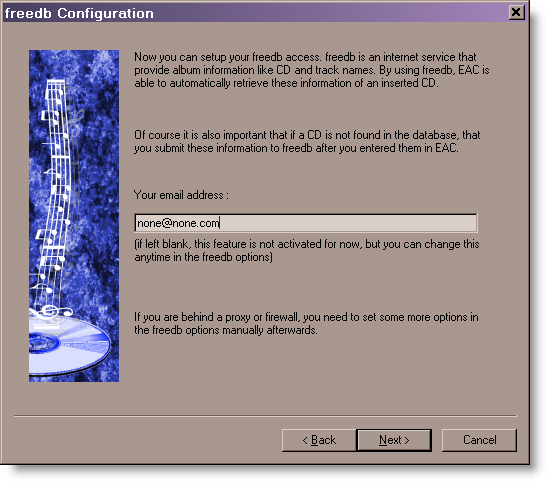 Music Engine to extract the files to FLAC format. Can be played around your home by devices such as the Sonos Zone Player and the SlimDevices SlimBox2 and in your car by the PhatNoise PhatBox players. 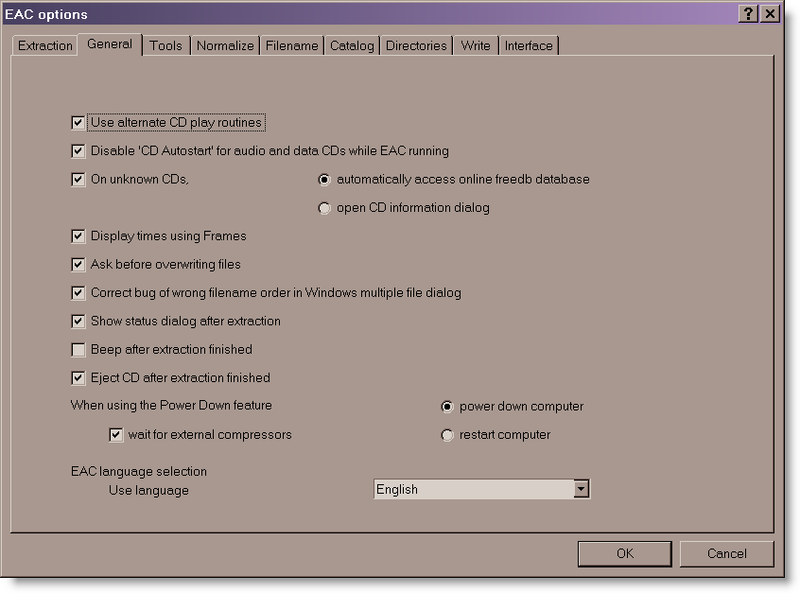 Windows Media Player (versions 9 or later) to extract files to the WMA Lossless format. Can be played by home devices such as Roku SoundBridge, Windows Media Center PC, and possibly Windows Media Extenders (untested). Apple iTunes to extract to Apple Lossless format. Can be played around your home by the Apple Airport Express and the Apple Airport Extreme. However, none of the methods above guarantee bit-perfect extraction from the original CD. To get bit-perfect extraction and insure maximum fidelity, look to the methods outlined below. There are multiple lossless codecs from which to choose, including FLAC, WMA Lossless, Apple Lossless, Shorten (SHN), Real lossless, Monkey’s Audio, OptimFrog, WavePack, etc. For a detailed comparison of lossless formats, check out the HydrogenAudio Lossless Comparison page. I highly recommend the free, open-source FLAC codec as it is widely supported, freely implemented, and full-featured. There is no reason for any device manufacturer to not support FLAC unless they are trying to push their own format. FLAC is the format used for these instructions. 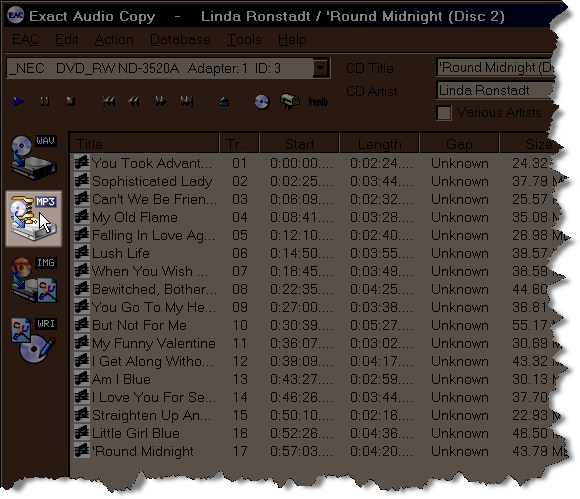 Media Monkey – Plays FLAC, Edits Tags, Downloads cover art, converts between formats, great all-around program. 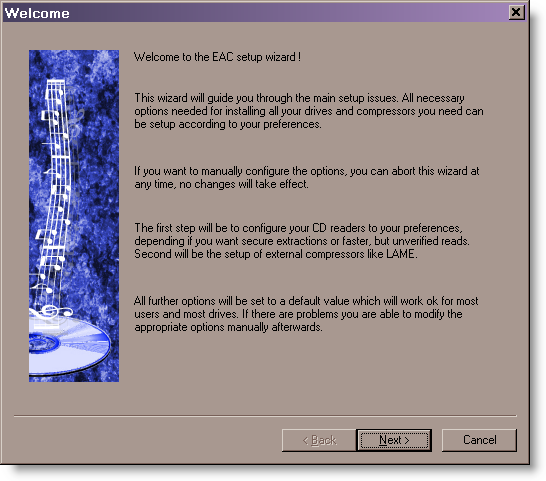 Go through the EAC Setup Wizard, use the settings shown below. 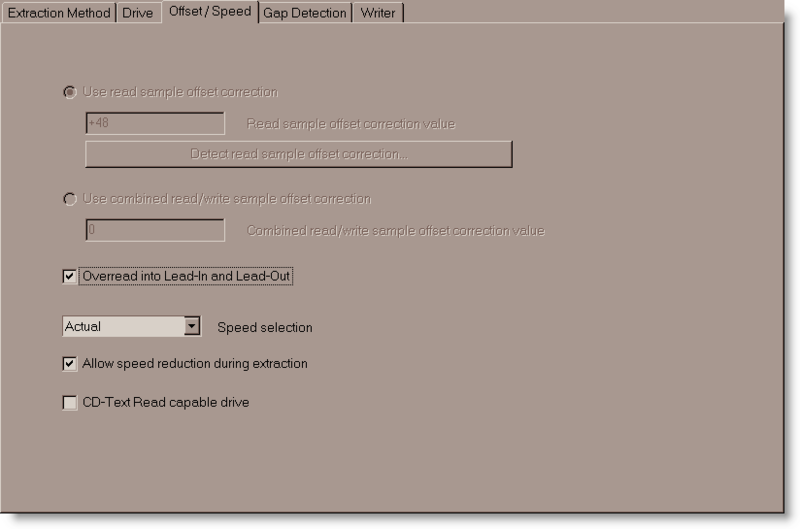 Before using AccurateRip, it is necessary to determine the read offset for your CD / DVD drive. According the the AccurateRip website: every CD drive has a slight reading offset, this value tends to be fixed for each type of drive and is constant. 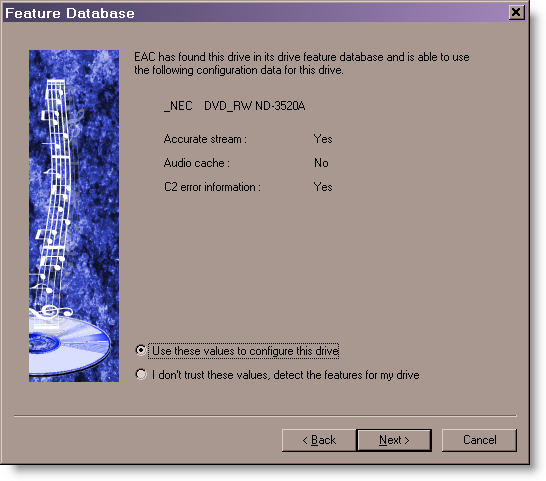 If the drive does not support AccurateStream, (i.e. 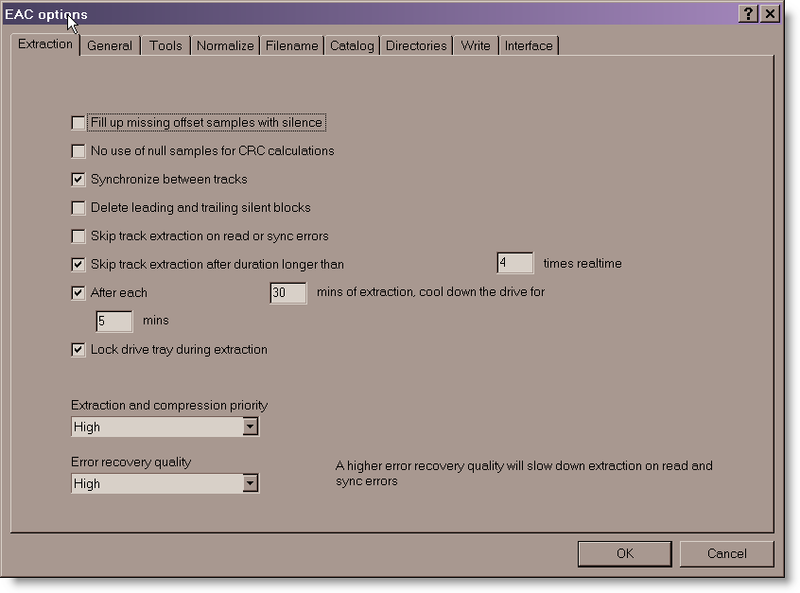 it has a varying offset each time a track is read) then AccurateRip cannot be used because it will never be able to configure itself. 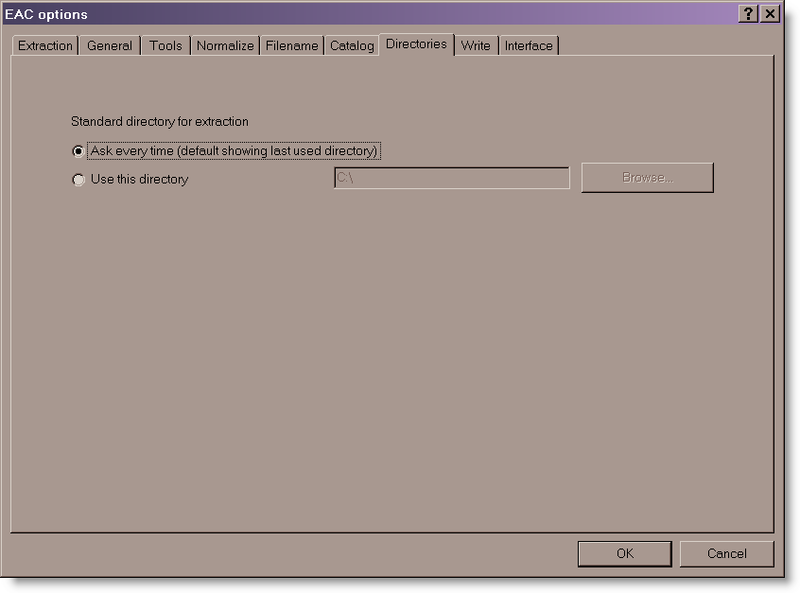 AccurateRip will find the drive offset by using keydiscs (a disc someone else has previously accurately ripped and added to the AccurateRip disc database). The key disc must have more than 5 tracks of a certain length. To configure AccurateRip, insert known keydiscs into your CD drive; a list of keydiscs is available on the AccurateRip Website. 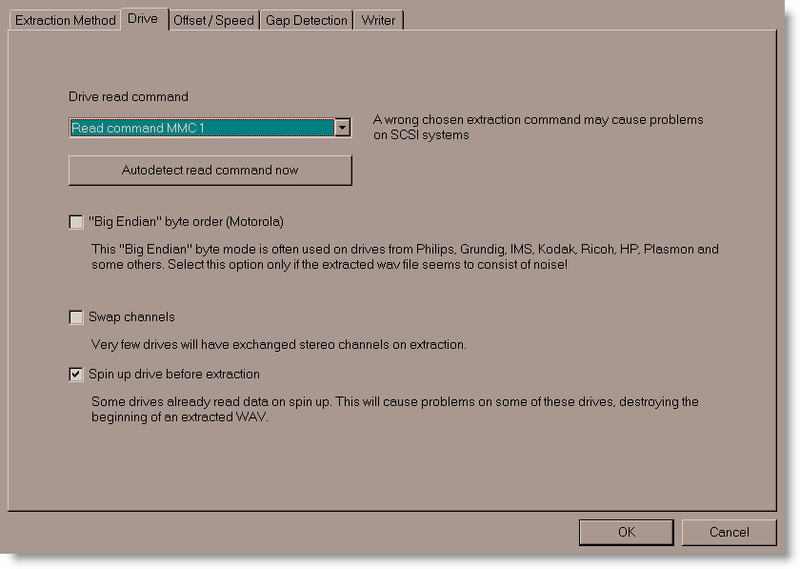 If the disc is recognized, AccurateRip will automatically offer to find the drive offset. Some discs listed in the keydisc database may be from a different pressing than the disc you test, so don’t give up if the first couple of key discs are not recognized. When an offset has been found for a drive using the first keydisc, it has to match the offset already stored in the AccurateRip drive database. If it does not match, AccurateRip will require 3 keydiscs that give the same offset as the first keydisc. Do not use normalization! It will change modify the extracted audio. You will want to apply ReplayGain compensation instead, which is described later. I have it prompt me for the target directory each time, but you can just specify a default directory such as D:Music. These really aren’t important for ripping. 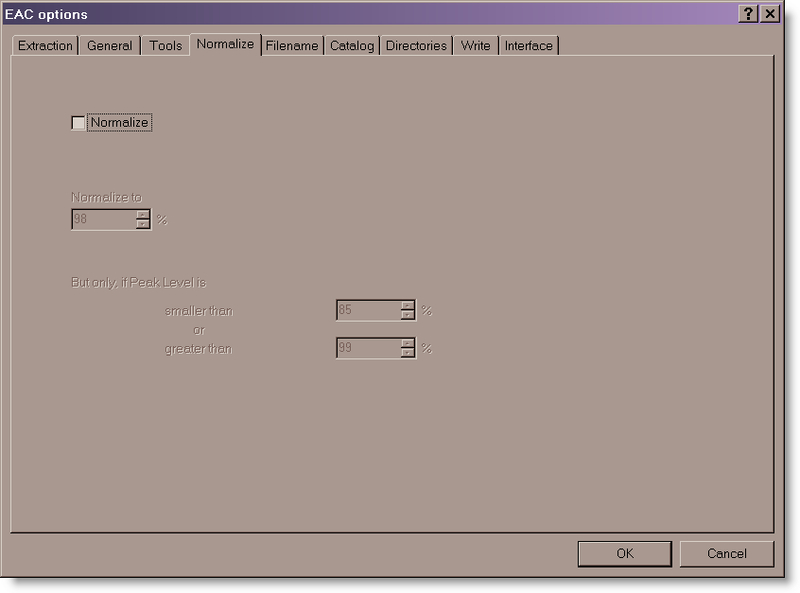 If you are using WinXP / Win200 / Win2003 Server, the following setting should work fine. 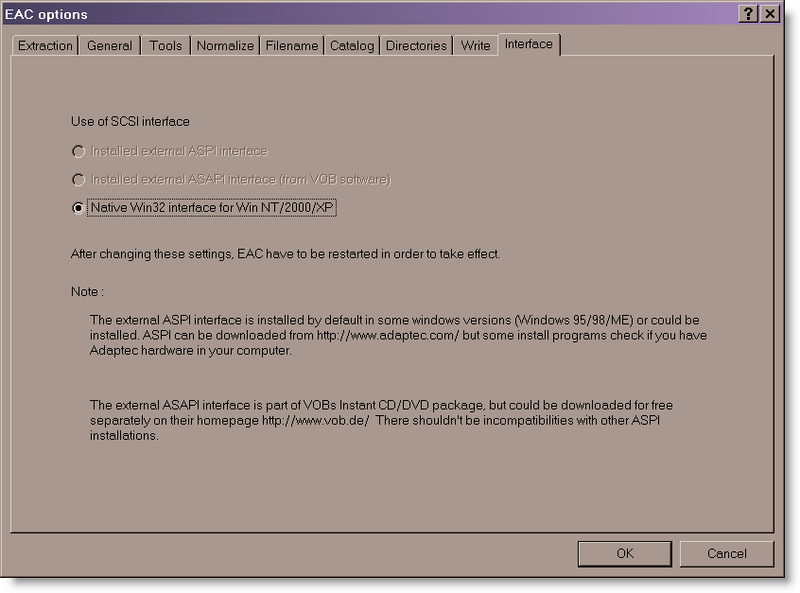 If you have problems, you may want to download the CDRDAO version of EAC or download the Ataptec ASPI interface. The EAC website can give you more information if you have troubles. 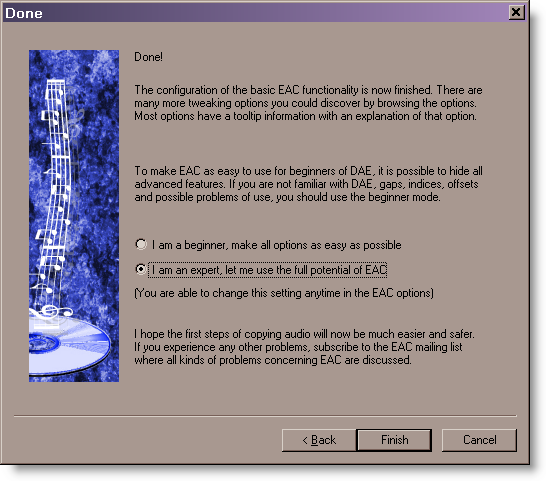 Go to the EAC -> Drive Options. 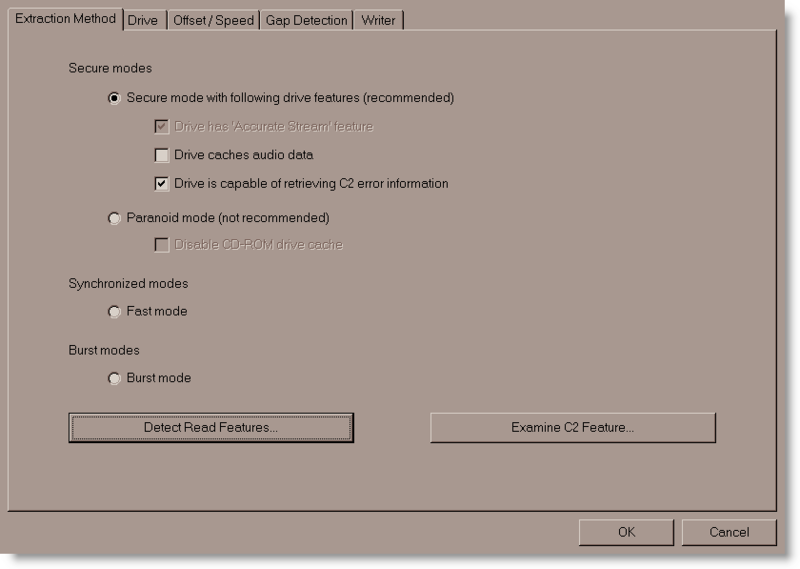 . . menu (or press F10) and make the following settings: Put a new CD in the drive and run the Detect Read Features test. 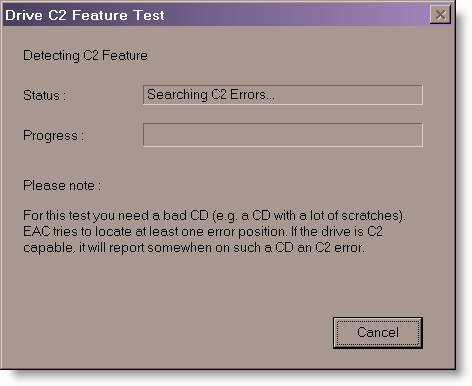 Put a scratched CD in the drive and run the Examine C2 Feature test. Experiment with the Overread into Lead-in and Lead-out feature if you get read errors at the beginning of the first track or end of the last track. Use the default / detected Gap/Index retrieval method. 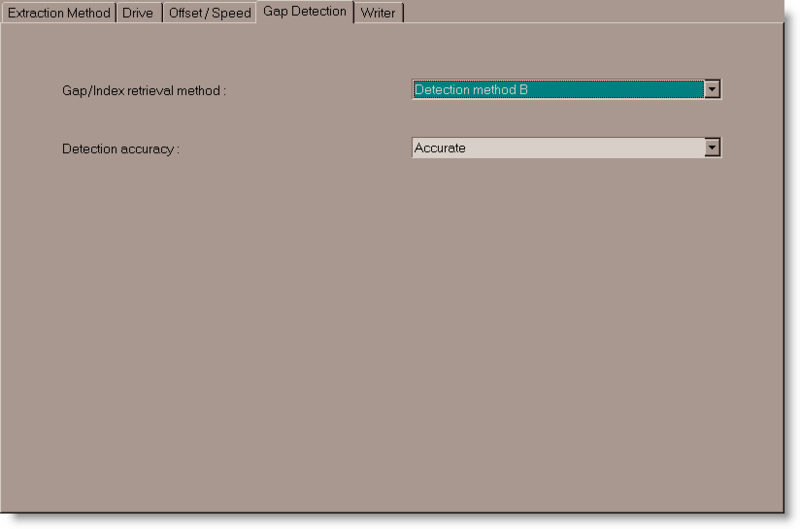 I set Detection accurate method to Accurate; Secure and Inaccurate are the other options. Accurate and Secure both perform multiple reads, just Secure makes even more re-reads and this causes the ripping process take even longer. Use Secure on if you’re willing to take several hours or more to rip a slightly scratched disc. Since this is for writing, the settings are not that important. For the Additional command line options, use the following. The -8 setting will give maximum compression. If you have a very slow computer, you may want to try -7 or -6. See this page for a complete list of FLAC command line options. You are now ready to rip CDs to FLAC files! Just click the MP3 button to rip to a compressed file. This will not result in an MP3 being created; the MP3 button should really be called “the external file compression program” button. 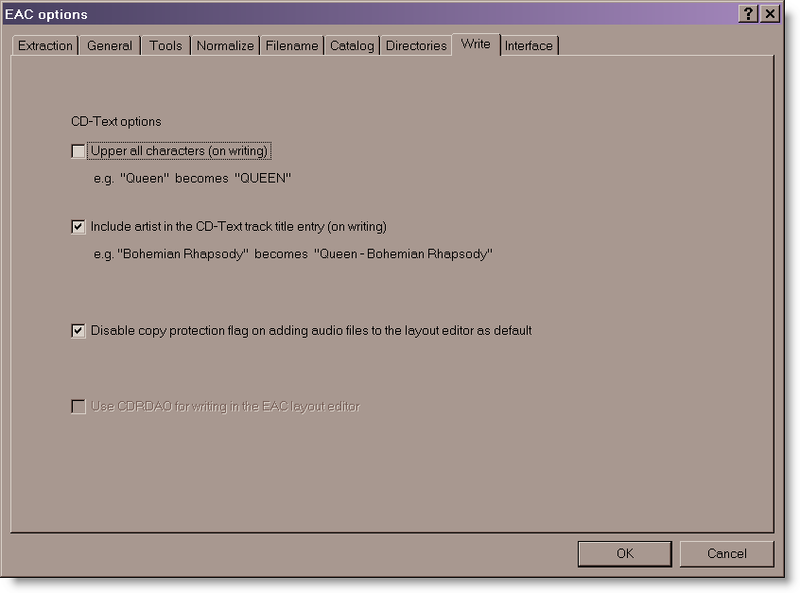 After making the configuration changes above, clicking the mp3 button will result in a FLAC file being created. Go to the Database menu and select Send AccurateRip Results…. Make the following Scheduled Submission settings to add results to the AccurateRip disc database. This, in part, helps create more keydiscs. You’ll eventually find songs not taggeg properly when ripped and these are the best way to correct that. The tag editors are generally pretty straight-forward to use. The two best editors I’ve found are Mp3tag and TagScanner. These free programs can lookup tag info from the freedb database to retag files. They can also rename files based on the tags or retag songs based on the file name. Media Monkey is a great alternative, all-around app that can edit tags and do about everything else you’d want. Many music players will display cover art. Album Cover Art Downloader is an app completely dedicated to getting the pictures into your music directories. 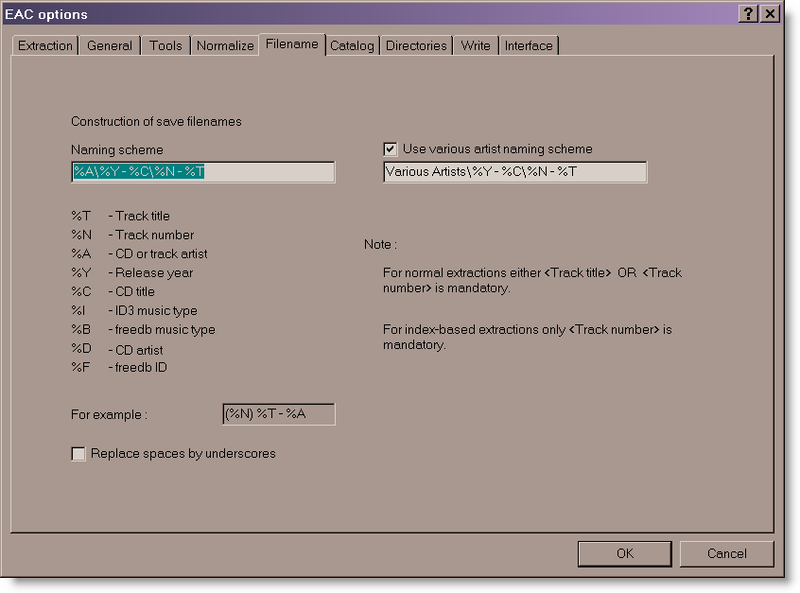 This program can’t read the tags for FLAC/OGG files (only ID3 tags are recognized), but it can be configured to identify albums based on folder naming. Even with this setup, it still can get the album name wrong, so I have to manually delete the date before clicking “download covers”. 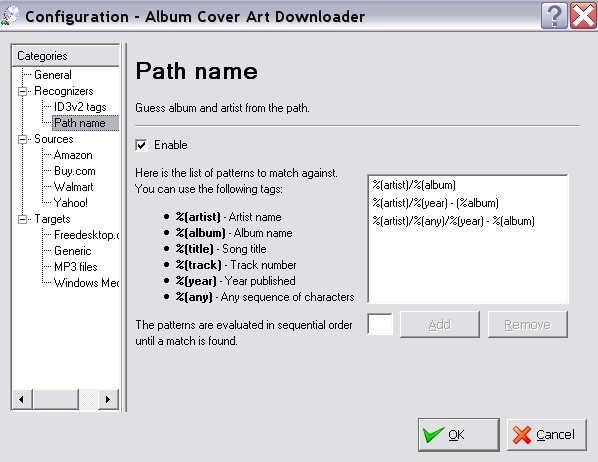 Anyway, here is how I have Album Cover Art Downloader configured to identify albums based on folder/sub-folder naming. Media Monkey is a great all-around program that does album art and also plays FLAC, Edits Tags, converts formats, etc. It will ready the tag info for about every format you can imagine, so it can be useful to modify any titles/folders that Album Cover Art Downloader doesn’t recognize. This is complicated enough for a separate explanation, so I won’t go into details here. ReplayGain will analyze and calculate the peak volume level for an entire album or each individual song and write a tag in the header of the file. It does not actually change the audio data within the file but rather give a “volume offset” that the audio player uses to pre-adjust the song to the proper playback level (independent of the player volume setting). I am re-ripping every CD again now into FLAC. I had originally done it the first time with EAC (as a rookie) .99 Beta and ripped all 350 of my CDs. Now I am going at this again 4 years later and found your webpage. I see there are more options in the latest 1.0 beta 2 of EAC… would you possibly be able to update your page? Sorry, I don’t have a Windows PC to test it on. Most of the settings should carry over to the new version. Hey Carlton. I have an internal SSHD. Can I safely rip to that drive in my music folder or will that drive be broken sometimes. How many times can I overwrite etc.? There is nothing different for Solid State Drives vs. conventional spinning disk hard drives. The data integrity is the same…and both can eventually fail, so be sure to keep a separate backup! This is a commandline for the program. How can I do something in the same way with Cuetools? Ian, I’m not sure which of the items is causing the issue. The required items for ripping the file correctly are -8 -V –replay-gain. The others are for tagging the file with the correct metadata. Try removing the tagging options starting with -T one at a time until you find a combination that works.